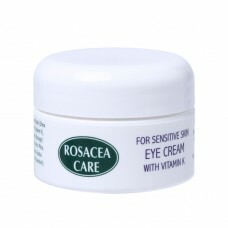 Feeds and nurtures the tender skin around the eyes. Soothing, anti-aging and anti-wrinkling, with sun-protecting Titanium Dioxide. The Vitamin K helps in the healing of capillaries that can sometimes leak blood in the eye area, while Borage Oil provides a kind of "tea" for sore eyes. Paraben free. From the fruit of the karite tree. The essential fatty acid gamma linolenic acid (GLA) from borage and oil is one of the most effective agents for the treatment of skin disorders and for the maintenance of healthy skin. acid oil that is known so far. Soothing and moisturizing. Very well aligned to the skin. Ingredients (INCI): Aqua (Distilled Water), Protein Biopeptides, Butyrospermum Parkii (Shea Butter), Tetradecanoic Fatty Acid, Octadecanoic Fatty Acid, Phytonadione (Vitamin K), L-Sodium Hyaluronate, Dimethicone, Glycol Distearate, Borago Officinalis (Borage) Seed Oil, Limnanthes Alba (Meadowfoam) Seed Oil, Glyceryl Stearate, Glycerin, Mica, Titanium Dioxide, L-Arbutin, Whey Protein, L-Alpha Bisabolol, Vitex Agnus-Castus (Chaste Tree) Extract, Polysorbate 60, Xanthan Gum, Jasminum Officinale (Jasminol). Use day or night in combination with Moisturizer, Night Cream, Facial Gel or Serum. Can also be applied to other parts of the face and forehead.